Reservation-For UR-11,OBC-8,SC- 5 and for SC-4 Posts. Reservation-For UR-05,OBC-03,SC-02 and for SC-02 Posts. Civil Engineering --08 Posts. Reservation-For UR-03,OBC-02,SC- 02 and for SC-01 Posts. Electrical Engineering-20 Posts. Reservation-For UR-08,OBC-06,SC-03 and for SC-03 Posts. Electronics Engineering-04 Posts.Reservation-For UR-01,OBC-01,SC-01 and for SC-01 Post. 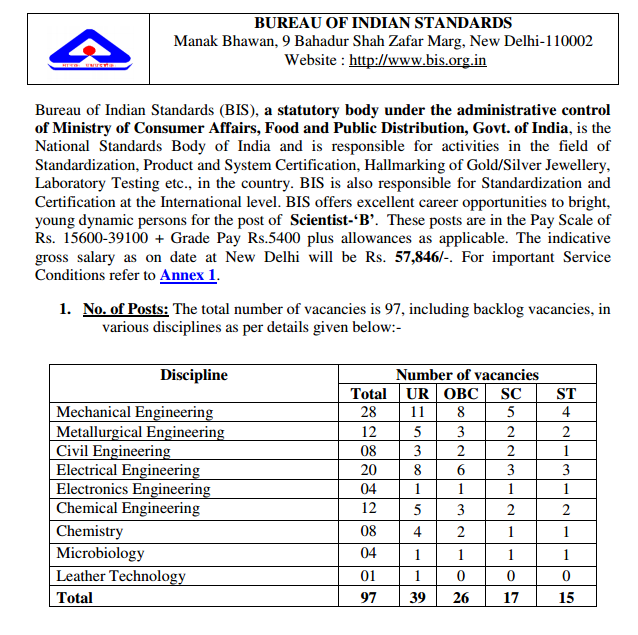 Chemical Engineering-12 Posts.Reservation-For UR-05,OBC-03,SC-02 and for SC-02 Posts. Reservation-For UR-01 Post. Total-97 Posts. Qualification-Bachelor’s Degree in Engineering or Technology with not less than 60% marks in aggregate (50% for SC/ST candidates). Chemistry-08 Posts.Reservation-For UR-04,OBC-02,SC-01 and for SC-01 Post. Microbiology-04 Posts.Reservation-For UR-01,OBC-01,SC-01 and for SC-01 Post. Qualification-Master’s Degree in Natural Science or equivalent in concerned discipline with not less than 60% marks in aggregate (50% for SC/ST candidates). Age as on 01.09.2015- 21-30 years. Process of recruitment : Written Test and Type Test. Last date for depositing examination fee online-08.09.2015 to 24.09.2015. In-service employee send their application form with No Objection Certificate. No fee for SC/ST/PWD/Women Candidates and other see in advertisement. Probation Period : Two years for all posts.